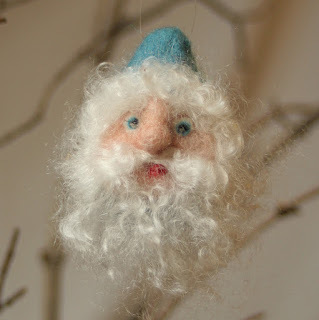 I often make large gnomes that sit on a shelf or table, but last Christmas I made a few small ones for ornaments, and they were popular. I usually make the beard tight and close to the face, but one of my students recently made a long beard, so I had to try that. The way it looks tickles me! The really fun thing about making faces is that each one comes out differently, even if exactly the same technique is used.